Artifacts is a solid debut novel from Mary Anna Evans. Originally published in 2003, this introduction of the character Faye Longchamp won some awards and began a series that continues still. Faye Longchamp is a mixed race woman trying to make ends meet. She works part time at an archaeological dig near her Florida home, not so much for the money as for the hope that she will find a way to continue her collegiate studies in the field. Her former professor is leading the dig, and this is her way of trying to help. Longchamp, though, needs much more money than a low wage part-time job would provide. She has inherited a large home on a barrier island, one that is in poor repair and is far behind in tax payments. Needing money to refurbish and keep her home, she engages in a legally questionable side job–selling artifacts she finds near her house on the gray market. She knows enough and cares enough to avoid contaminating significant sites, but some of her finds are on public lands and therefore legally cannot be sold for personal gain. Her desperation, though, makes her willing to break the law. During one of those illegal digs, she unearths a body. Clearly not recent, but not from the far distant past either, she realizes that she has stumbled across a murder victim whose murderer may still be alive. The next day, two of the other assistants at the dig are murdered. Though a relationship between the two crimes is not obvious (since they are in different locations), the timing can hardly be coincidental, and Faye finds herself swept into the middle of finding justice for her two colleagues and for a teenager killed forty years earlier. Mary Anna Evans has written many more books in this series. So far, I have only gotten to read one other. Findings is a few years later than Artifacts. Longchamp has secured some funding streams to restore her beloved home, Joyeuse, and to pursue doctoral studies in archaeology. She is in a relationship with a lawyer from Atlanta who would like to see things progress further. Faith is now pursuing more academic and legitimate archaeological work. Many of her findings go to the Museum of American Slavery, run by her friend and mentor, Douglass Everett. On the night when she discovers an exquisite emerald hidden in a box of otherwise worthless junk covered by dirt, Douglass is murdered in the basement of his own museum. The emerald is not taken, having been hidden by Douglass in his last act before his brutal murder. Later, an old associate of Faye’s from her free-lance archeology days is also murdered, dying in her arms. This leads Faye on a search for buried treasure: the rest of the emerald necklace, rumored Civil War gold, and the buried secrets within her own heart. I liked Artifacts, but I loved Findings. 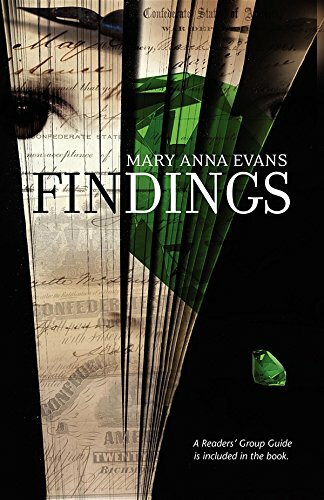 Seeing a writer grow from a first novel is a joy I am beginning to appreciate, and Mary Anna Evans’s skills have grown appreciably. The story is deeper, the characters more evolved, and the descriptions of the Florida coast are more evocative. This is a series worth coming back to, and now there are 11 books to explore and enjoy. Faye Longchamp is a strong woman of mixed race, a characteristic which makes her unusual in genre-fiction. She is also a woman who grows and matures through the series. When we first meet her, she is skirting the law by selling artifacts to make ends meet. Through the series we see her get her academic degrees, become a strong ally of the law, fall in love and get married, and mature as a character. We see her positively change the lives of her friends and loved ones. In short, we see her “grow up.” Often in series a character remains much the same, never aging, never maturing, never learning. This makes for a timelessness which is useful to the author. Having your protagonist change makes life harder for the writer, but is very rewarding to the reader. There is value in reading the books in order (although I admit that is not what I have done). We see the growth in the characters. We also see the growth in the writer. Both of these make for compelling reasons to come back to this series again and again. 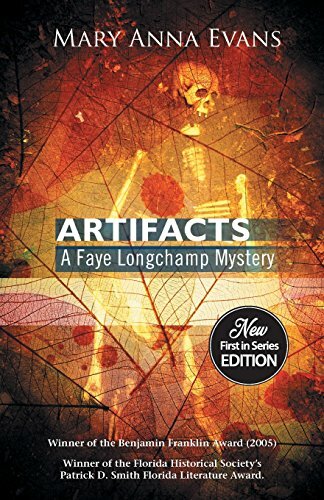 Artifacts and Findings are both terrific books, and both make me eager to continue with this series. If you are into mysteries, strong female characters, archaeology, and even historical fiction, this is a series worth your attention. It is also one which, although it features adult characters, could be enjoyed by teens who want something a little more mature but who don’t want one with excessive violence or “adult” themes.